Southern Lights, a signature, long-term art installation by artist Chris Robinson, will span the Congaree River between the Blossom Street and Gervais Street bridges. Scheduled to light up every evening in Cayce, West Columbia and Columbia for the next decade, this installation is coming to fruition through supporters including, What’s Next Midlands, the Congaree Vista Guild, the South Carolina State Museum, EdVenture, the City of Columbia and One Columbia for Arts and History. The laser installation will launch on Saturday, Aug. 19, as part of the Total Solar Eclipse Weekend celebrations. With the support of the cities of Columbia, West Columbia and Cayce and Richland County, the installation’s design is meant to connect our cities and the Midlands community. The project offers an innovative approach to public art and celebrates and highlights public infrastructure uniquely. Southern Lights will be the only installation of its kind in the United States, and celebrates the work of Charles Townes, a native South Carolinian whose theories led to the development of laser technology. Along with leadership and support from the communities who touch the bridges, leaders in the Midlands business community, including BlueCross BlueShield of South Carolina, are sponsoring the project, which will cost an estimated total of $120,000, a value for a signature art piece that will be part of the fabric of our region for a decade. Robinson, a professor in the School of Visual Art and Design at the University of South Carolina, concentrates on contemporary science and technology and its role in decision-making through installations and digital drawings. He holds a BFA from Florida State and an MFA from the University of Massachusetts and is the recipient of many awards including the Leonardo da Vinci Space Art Award and the Palmetto Pillar Award, along with many competitive art awards. He has lectured, written and exhibited extensively throughout the Americas, Europe and Asia. Robinson has completed dozens of large-scale installations in his career, most notably installations on the National Mall in Washington, D.C. (in conjunction with Rockne Krebs), and in Columbia his light installation at the celebration of the opening of the South Carolina State Museum in 1989 and for the Governor’s Carol Lighting at the South Carolina State House in 1992. Southern Lights is representative of Robinson’s body of work and marks the end of Robinson’s academic career in the School of Visual Art & Design at the University of South Carolina (May 31, 2017). Robinson will become chair of the Department of Art at USC Beaufort this fall. Robinson will have Southern Lights completely installed by August 2017 but will test the lasers along the way. 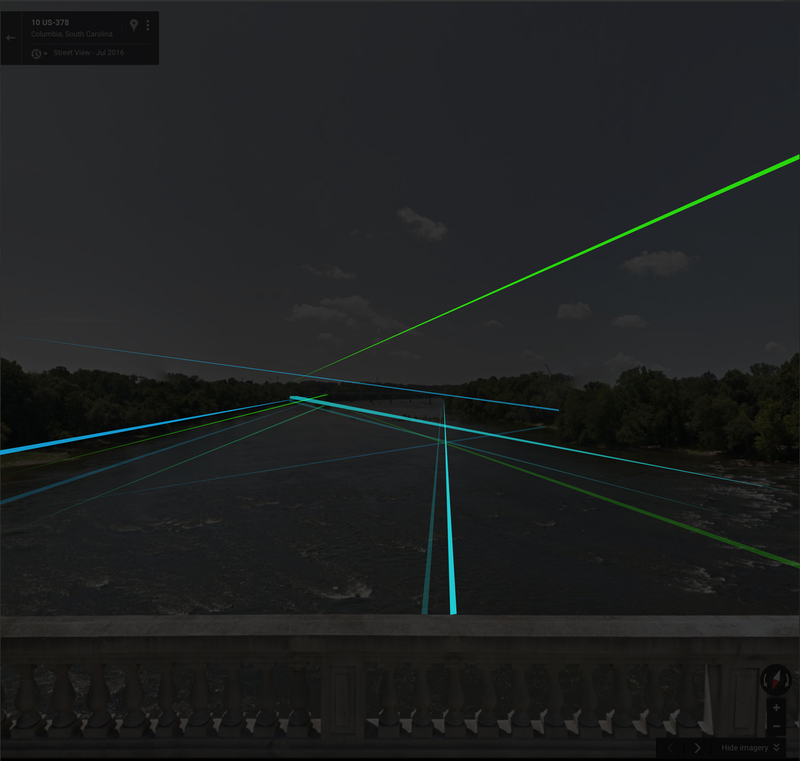 Two lasers are installed at points on the banks of the Congaree River. One laser is at the City pump station below Founders Park, the USC baseball stadium, and the other is at EdVenture. Additionally, a series of mirrors that will reflect the lasers will be placed on existing structures, including on the rooftop of Bridgepointe Condominiums in West Columbia. The lasers are blue and green in color and mirrors along the river and on the bridges will reflect the lasers. Viewers who take in the installation can expect Southern Lights to look different from different vantage points. Southern Lights will formally kick off at an event on Saturday, August 19 in the evening in celebration of the Total Solar Eclipse Weekend. The tie-in with the eclipse means that our region’s new signature art piece will be celebrated by locals and tourists alike. Stay tuned to SouthernLightsSC.com for event details. This installation is slated to light up the night for three hours every evening for the next 10 years, (times will change depending on what time the sun sets) or as long as the equipment holds up. The City of Columbia is committed to the ongoing maintenance and management of Southern Lights, as is the South Carolina State Museum. Those who cross the Gervais and Blossom Street bridges or visit the riverfront regularly will be able to take in Southern Lights, and with signage and wayfinding surrounding Southern Lights to come, visitors to the region will discover this major attraction for years to come. For more information on Southern Lights, visit SouthernLightsSC.com and on social media via #SouthernLightsSC.